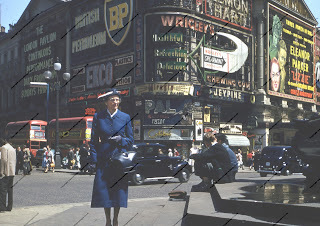 Piccadilly Circus, one of the "must have" photo opportunities for tourists in London. 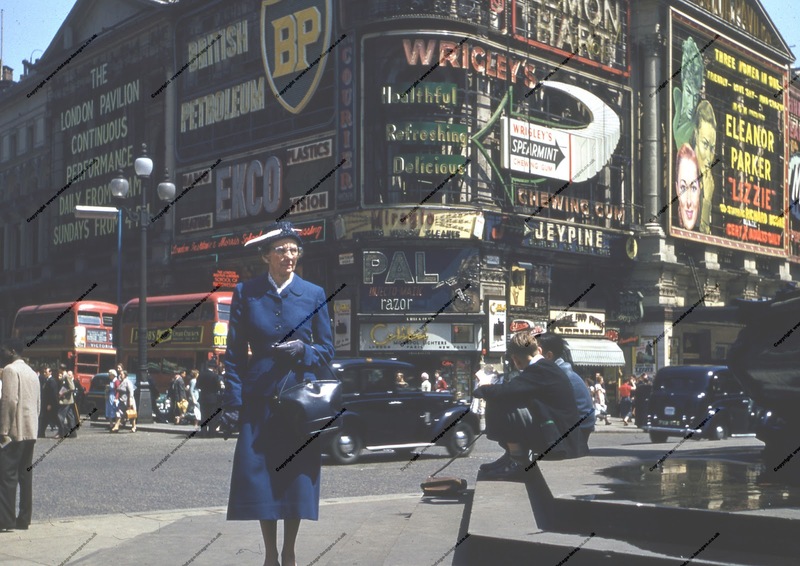 Seen here in 1957 with a very well dressed American tourist posing for the camera. Something outwith the shot seems to have grabbed her attention, but not her approbation judging by the severe look on her face! The Pavillion, is no longer festooned with advertising as seen here. Piccadilly Circus only has one building covered with adverts now, and these are electronic with light emitting diodes now rather than neon filled glass tubes and it is all rather clinical. 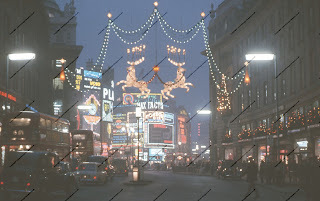 In 1957 it was a blaze of lights and one of the sights of London at night when it was a riot of colour. Some of the adverts here are still household names and some have long gone. British Petroleum is still one of the largest oil companies but Ekco - the television and radio manufacturer - has gone and is now merged as part of Phillips Electrical Industries. You can no longer buy Pal Injecto-matic Razors, a product of the American Razor Company, nor can you purchase Miraglo lighting window cleaner which perhaps was not as good as its adverising led one to believe. Colibri lighters are still manufactured, although the monopol is no longer in the range available today. Wrigley's is still one of the leading brands of chewing gum, although originally the company made baking powder and chewing gum was offered initially free with each packet. However the gum became more popular than the powder and Wrigley's then concentrated on gum manufacture. Lemon Hart Rum, now billed as "100% Demerara -The World's Most Flavourful Rum" has been around as a blend since 1804 and the company can trace its origins back even further to 1720. Jeypine is still used for hospital disinfecting and is available in the Far East but does not appear to be available in Britain although the Jeyes group still sells Jeyes fluid here. At the Pavillion, a cinema which closed in 1986, Eleanor Parker stars in Lizzie, a drama filmed in black and white. The film is shown as a continuous performance, so that if you walked in half way through one showing you could stay and watch the first half after you had watched the second half - confusing when it was a drama or a mystery film! The cinema was gutted after closure and has undergone several metamorphoses since and is now the Trocadero entertainment centre with, ironically a seven screen cinema as part of the complex. The facade of the Trocadero is now bereft of illuminated adverts. The scene below is of Piccadilly Circus from Regent Street at night around 1961 with the Regent Street Christmas decorations adding to the light show.